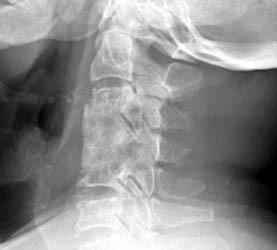 70 y.o male with initial complaints of he patient is a 72-year-old Asian-American male with an approximate one to two year history of neck pain. The patient had cervical nerve blocks in the past that gave him temporary relief. He now states that he has bilateral arm and hand numbness all the time. He also complains of neck pain and pain that shoots down to his right leg. 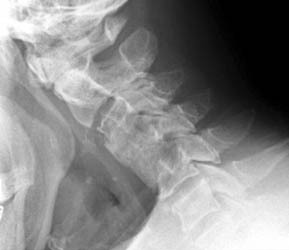 The patient underwent anterior cervical discectomy and fusion at C3-4 and C4-5. Lateral flexion and extension views obtained five months after surgery obtained for surveillance. Note postsurgical changes of anterior fusion of C3 - C5, however the fusion is not solid at C4 - 5. Movement is detected on the flexion and extension views at the level of the graft itself.